The well-known verse from the Book of Esther in the Purim story couldn’t be more appropriate to describe today’s atmosphere of intensifying social division and polarization. 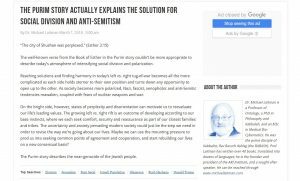 Reaching solutions and finding harmony in today’s left vs. right tug-of-war becomes all the more complicated as each side holds sterner to their own position and turns down any opportunity to open up to the other. As society becomes more polarized, Nazi, fascist, xenophobic and anti-Semitic tendencies reawaken, coupled with fears of nuclear weapons and war. On the bright side, however, states of perplexity and disorientation can motivate us to reevaluate our life’s leading values. The growing left vs. right rift is an outcome of developing according to our base instincts, where we each seek comfort, security and reassurance as part of our closest families and tribes. The uncertainty and anxiety pervading modern society could just be the step we need in order to revise the way we’re going about our lives. Maybe we can use the mounting pressure to prod us into seeking common points of agreement and cooperation, and start rebuilding our lives on a new consensual basis? The Purim story describes the near-genocide of the Jewish people.